ERIE, Pa. — The Boston College women’s hockey team had some company on their charter flight from Boston for the NCAA Frozen Four. Boston University punched its ticket with a quarterfinal win against Mercyhurst and Wednesday boarded the same flight to Erie. Not much was said between the teams who were separated by a few rows. After all, if everything goes their way tonight, they will be competitors Sunday. The unique arrangement was likely an economical decision, said BC coach Katie King. The travel didn’t overshadow the experience for teams vying to become the first Hockey East representatives to reach the championship game since the tournament began in 2000-01. No. 4 BC (24-6-6) will face top-seeded Wisconsin (35-2-2) in the first semifinal at 5 tonight at Tullio Arena. The second semifinal will follow between No. 2 Cornell (31-2-1) and No. 3 BU (26-6-4). Although this is the first trip to the semifinals for BU, it’s the second appearance in five seasons for the Eagles. BC earned its semifinal berth with a 4-1 win over Minnesota six days ago. The Eagles’ last trip to the Frozen Four ended in a 4-3 double-overtime loss to Minnesota-Duluth in 2007. BC enters this season’s semifinals with a six-game unbeaten streak and its first Hockey East Tournament title. 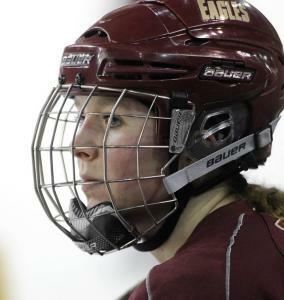 Stack is a finalist for the Patty Kazmaier Memorial Award, presented to the top women’s player in Division 1. After collecting 36 goals and helping BC average 2.89 goals a game, Stack was selected the 2011 Hockey East tournament MVP. She was last season’s league Player of the Year. BC is allowing 1.69 goals a game, third in the country. Goaltender Molly Schaus has posted a 1.40 goals-against average in her senior season. With all the success this season, Stack said facing the top team will not change BC’s approach. The Eagles have lost all three meetings with Wisconsin since 2000. Yesterday the teams took to the ice for the first time in the arena that holds 5,524. It is the first time the event is being held in Pennsylvania. There are some adjustments in playing on neutral ice, but the arena has what Stack described as a “homey’’ feel. While the Eagles were becoming familiar with the Tullio Arena, King said a few other teams will become more familiar with the Hockey East. Monique Walker can be reached at mwalker@globe.com.